How many DNET masternodes you hold at the moment? I don't want to centralize this. would like to know too. And where are your servers located? if you have different locations can the customer split masternodes between locations? On the locations, they are all located in Cincinnati. These are owned servers so there is a lot less overhead for my team and I. Branching out to other locations means additional overhead. anyone having trouble sync there wallet mine has been on 33 hours for a few hours now ?? I also have a sync problem. Stop at 157157 ? It would be very nice to have something like http://178.254.23.111/~pub/masternode_count.png but for DarkNet. Do DarkNet have a similar MN graph ? Thanks. It is already in the wallet, and I know the team has a website in the works that is going to be similar to DashWhale. I had that problem the other day, delete the block chain and allow it to re-sync. and I know the team has a website in the works that is going to be similar to DashWhale. Anyway, the dumper keeps dumping. Must have a lot. No graph yet. But we have the main information page for it. Hopefully graph and other charts ill follow. "masternode list-conf" from your controller wallet should show the status of each of your masternode. Make sure it says enabled. Also, "masternode status" from your masternode should show service IP address, CtxIn & pubkey. Make sure those are same as your IP, tx ID& wallet address on the controller wallet for that MN. Nice service. 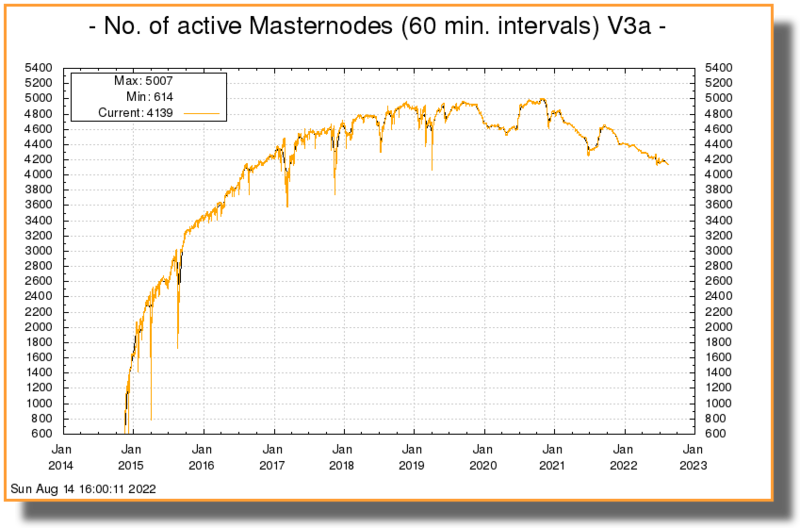 Though I wouldn't expect an increase in masternodes for now (at least until the price increases). Currently each masternode generates about 36 coins per day and $2 is roughly 26 DNET per day so 10 DNET profit per masternode. ROI is 2.7 years. Of course the price will likely climb in the future. Thanks. I think we need this masternodes chart asap. This will help a lot to show how strong the network is getting, and also help to increase the price. Sure, then 2 x ROI but you know what I mean which is that currently there are much better opportunities of investing. Of course it will change so people being on the fence and couldn't decide to invest or not might want to calculate with future prices. But it's a risk. any updates of whats going on behind the scenes? how far along is total anonymous transactions? how will zcash help us?.